Good call doctor. I find the stub coupler/feed at the larger diameter of the cavity interesting...thinking this was the end with the highest return loss/standing wave at 2.4 GHz...perhaps not. 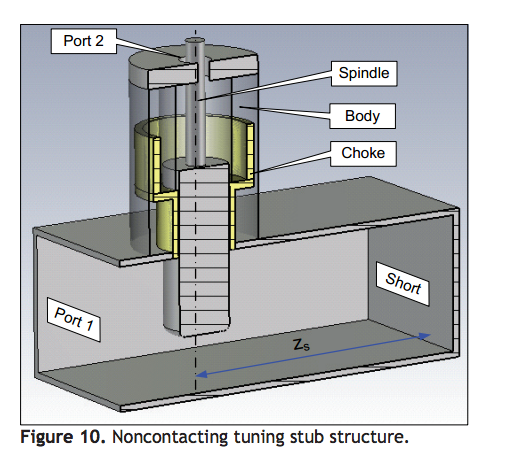 The stepper motor appears to be adjusting the length of a tuning stub centered in the cavity on the narrow end, probably something like this: http://i.stack.imgur.com/Vfdxq.png Its and old tried and true methodology. Back a ways there existed in woo land something called a "Slepian Drive". Same guy? "We conclude that a new breed of propulsion scientists is required as they will need to be cross disciplined into a variety of the physical sciences to include: electromagnetism, spacetime and string-brane theory to but name only a few." That page requires Yahoo login. If that stub extends inside the frustum, that would explain why he put the input at the big end. I still say, it should be at the small end to avoid perturbing the harmonics. Early on in this thread, there was a lot of discussion of potential spaceflight applications which could be enabled by emdrives if the tech were to be viable. Here is an opportunity to roll some of that discussion into the design of the "challenge criteria" for an XPRIZE. I don't think you can begin to design any sort of mission until you know the equation of motion in free space. I think Harold's lapsed patent on a resolver tuned vco could be adapted to keep the oscillator tuned to the cavity instead of the obverse. The EM Drive Demonstrator was feed via a waveguide from a magnetron Rf source, not via coax. You can see the magnetron & waveguide in these 2 shots. Assume that connector is for feedback sense. The initial delay has been blamed on the "tune-up" of the cavity. There are claimed to be stepper motors for adjusting the interior dimensions of the cavity. As these get adjusted and the Q increases the thrust increases. That's what has been quoted in this forum by others; from one of Shawyer's papers. There is no explanation based on Shawyer's theory for the thrust to continue after the RF drive has been switched off. For that to occur the cavity has to store energy and release it as kinetic energy. An inductor stores electrical energy and will release that electrical energy when the (DC) current flow is stopped. But there is no equivalent electrical effect that would explain why Shawyer's cavity stores RF energy and then releases it as kinetic energy, in spite of it's high Q. Or why there is a time delay. A likely explanation is the slosh of coolant. No doubt the coolant pump generates a measurable torque. His apparatus is susceptable to spurious torque. Any rotating machinery (motor, pump, etc) mounted on a turntable with it's rotational axis parallel to the turntable's will start the turntable moving when it is turned on. Even if the pump motor is mounted at right angles to the bearing axis the fluid mass flow could still cause rotation. When the rotating machinery is switched off the fluid mass flow stops and the rotation of the turntable will stop. That is just the conservation of angular momentum. Maybe Shawyer has factored this error torque from the coolant pump into his graphs. Is why the Rf frequency is adjusted via a feedback loop as used in the Flight Thruster. Well before we start designing missions, we could design some simple performance objectives first. A good place to start? Prove these thrusters work as advertised. ... and acceleration. That is why I believe now that it should be pulsed, not steady state operation. Somebody else pointed out that Shawyer's Demonstrator was feed via a waveguide instead of via coax. Does that make any difference to your point that feeding should preferentially occur (if possible) at the small end to avoid perturbing harmonics? In other words do you think that feeding with a waveguide avoids perturbing harmonics and therefore if one feeds with a waveguide (fed upstream from a magnetron) you could just as well feed the waveguide at the big end ? That also makes sense to me. Separately, but interestingly the Serrano Field Effect Boeing Darpa device tested by Dr. White displayed the highest thrust/InputPower of any device, yet it only showed very short time impulses (like Dirac Delta Functions) instead of steady state operation (although to me its principle of operation is very different from the EM Drive, Dr. White classified this device also as a Q-thuster). Evaluation of the test article in and out of a Faraday Shield performed from Feb through June 2013. • The magnitude of the thrust scaled approximately with the cube of the input voltage (20-110uN). • Specific force of transient thrust was in the ~1- 20 N/kW range. Separately, but interestingly the Serrano field effect device tested by Dr. White displayed the highest thrust/InputPower of any device, yet it only showed very short time impulses (like Dirac Delta Functions) instead of steady state operation (although to me its principle of operation is very different from the EM Drive, Dr. White classified this device also as a Q-thuster). Forgive me for interrupting, but with pulsing, do you mean Pulse Width Modulation or PWM?